Effective workforce management is key to sustained success. Learn how to avoid common mistakes that can affect performance. Managing a diverse workforce of exempt and non-exempt employees across many locations and sites is no easy feat. Finding and keeping best-fit employees is challenging enough, but you also need to optimize day-to-day functions like time and attendance, scheduling, labor cost and productivity tracking and compliance management to stay competitive and profitable. Given this complexity, it’s not surprising that management teams are not always leveraging their workforce processes and technology for maximum impact. Optimize staffing, manage absenteeism and minimize compliance risk. Keep employees engaged and empowered to do their best work. Understand how workforce performance affects business outcomes. 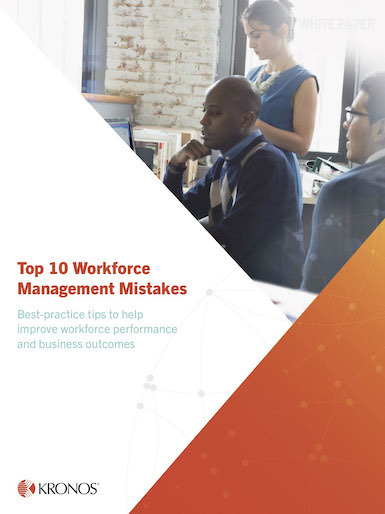 Download this informative white paper and find out how you can steer clear of costly workforce management pitfalls.